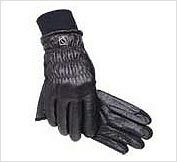 Winter riding glove in leather. Genuine leather for comfortable firm grip on winter rides. Complete thinsulate® lining for warmth without bulk. Key area rein reinforcement for longer wear. Spandex™ gusset for comfortable fit. Knitted cuff for added warmth.